Best fished either on a floating line and long leader, used either static or with a very slow figure of eight retrieve. 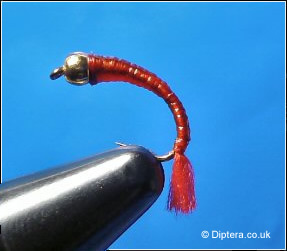 Place a 2 or 3mm Goldhead Bead at the eye of the hook shank, secure the bead with a piece of copper wire bent into a loop and tied down the hook shank with thread. Catch in a length of Red Flexifloss just after the goldhead bead and take the tying thread down the hook shank as far as you dare go, pulling the flexifloss tight as the thread is wound over it. Catch in a bunch of red floss to create the tail. Move the thread back up to the goldhead bead. Wind the flexifloss back up towards the centre of the hookshank, making sure the flexifloss is tight to create a thin body with a good ribbed effect showing through. For the upper part of the body, perform a few winds up to the goldhead bead and back down to the start of the upper body. Keep doing this until a nice tapered body is created. Tie off the flexifloss at the goldhead bead, trim the waste and whip finish. As a finishing touch I like to give the buzzer three coats of “Sally Hansens - Hard as nails” varnish.